I’m an alumnus of the University of Utah. As an alumnus, I get their alumni magazine, Continuum. With all of the other stuff I have to read, I rarely read the magazine all that closely. I typically just skim through the articles, looking for anything that might seem interesting. 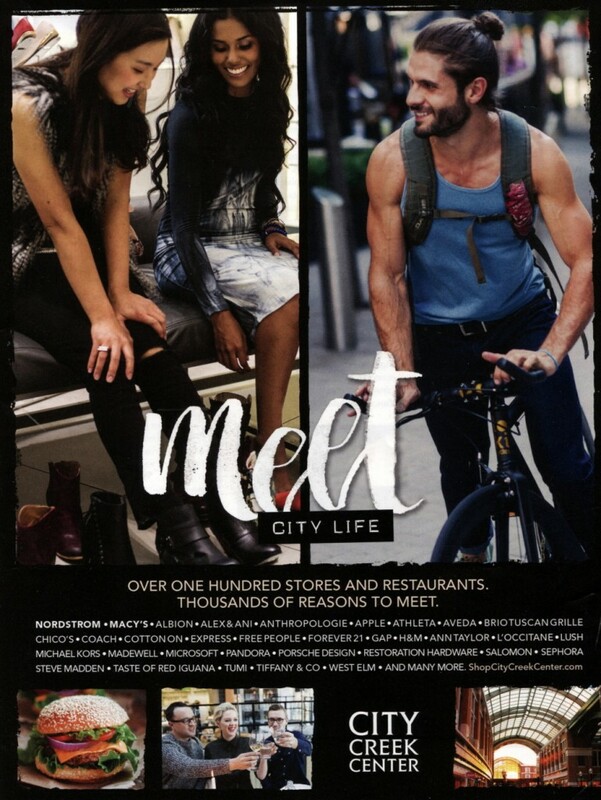 The latest issue was fine, but one thing did catch my eye – an advertisement for City Creek Center. Full page advertisement in Continuum. You’re probably already seeing some of the issues with this ad, but, in case you don’t, let me go ahead and point out the most obvious ones for you. On to the guy on the right. See any problems given what the LDS Church teaches its members about “proper” dress? It doesn’t get much more “heathen” than this guy. No garments, obviously! A man-bun? And facial hair? My old stake president would be calling him in for a worthiness interview instantly. Yeah, he may be physically fit and attractive, but temple recommend holder he is not. Again, what message is City Creek Center sending with this particular picture? That’s not water in that glass. 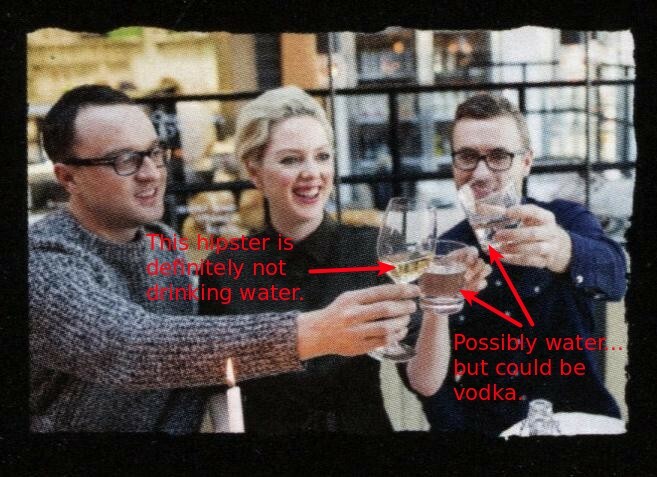 The two glasses on the right very well could be water. Of course, vodka and a variety of other liquors are transparent, too, so it may be something else. And giving that they are clinking their glasses together and saying something like “cheers,” I’m inclined to think it’s not water (though the middle individual sure has a lot of whatever is in her glass if it’s not water). Regardless of the two on the right, the glass on the left is definitely not water. Perhaps it’s carbonated apple juice, ’cause, sure, that’s what they have in stock at the various restaurants in City Creek Center, right? But cynical old me is thinking that’s a white wine. What, then, is the take away from this last image in the advertisement? Come to City Creek Center where we have alcohol, you can get inebriated, and have fun doing it (they are all smiling, even if the guy on the left is more smirking than smiling). 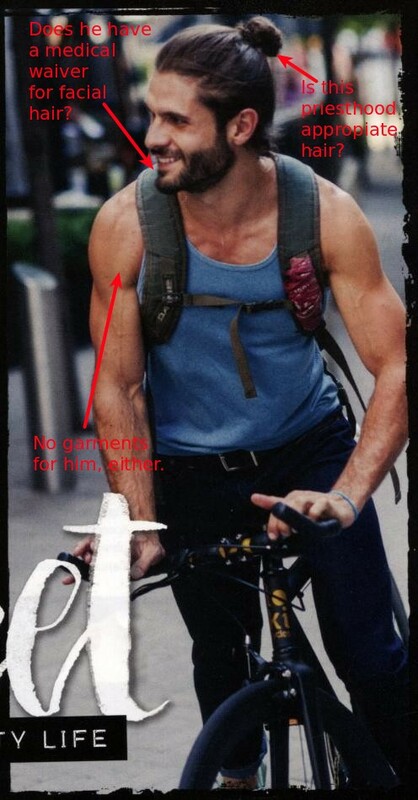 Overall, then, this ad for City Creek Center – the for profit shopping center run by the LDS Church – is conveying all of the following: we sell clothing that isn’t garment friendly for all genders, it’s okay for men to have long hair and beards, and drinking is fun. Hmmm… Isn’t that interesting. Seems like a rather cynical ploy by LDS, Inc. to increase the bottom line at the expense of the values they teach their members. I can’t help but also note that this ad was in an alumni magazine from the University of Utah. I’m sure LDS, Inc. would run a different ad in a BYU alumni magazine. The cynicism of the leaders of LDS, Inc. to put out an advertisement like this should be pretty shocking to me (but it’s not). It’s like their not even trying to hide their profit-seeking behind “family values” any more. This ad is a straight up sales pitch to get people to come to City Creek Center and violate the moral teachings of the Church. Congratulations, LDS, Inc., you win the award for most cynical advertisement of the year! Sunday in Outer Blogness: Mormon and Gay edition! Sunday in Outer Blogness: Unhappy anniversary edition!